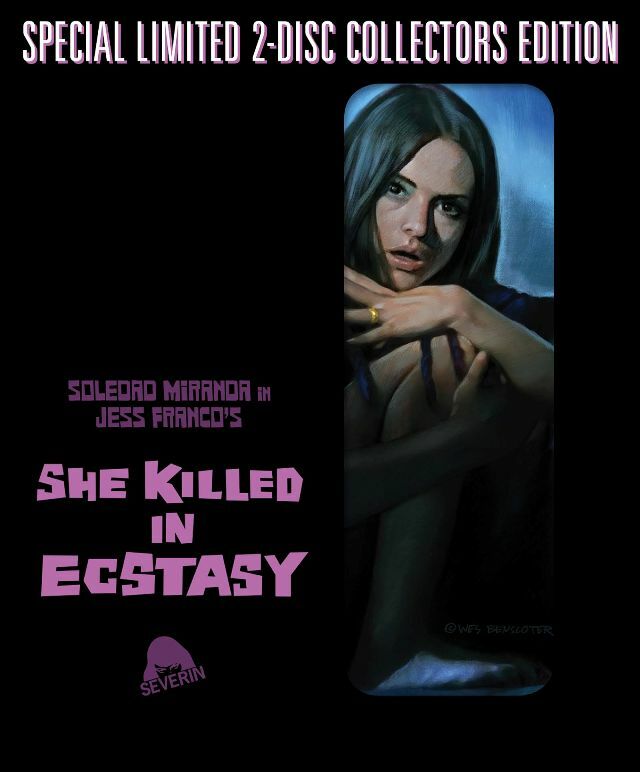 Digi-Schlock: SHE KILLED IN ECSTASY (Severin Blu-Ray/CD 2-Disc Set) – Schlockmania! One of the most interesting trends to emerge in the cult movie blu-ray world over the last few years is the unexpected comeback of Jesus Franco. Thanks to the efforts of a few devoted indie labels, Franco movies that were once hard to find are being treated to uncut, special edition releases. Severin has played a vital role in this resurgence and one of their latest Franco releases is She Killed In Ecstasy, an impressive edition of this film that adds an array of cool extras. A beautiful new transfer kicks the package off: the film is presented in its original 1.66:1 ratio, with a convincing celluloid texture and rich colors that make the most Franco’s pretty photography. Fans will be happy to note that this is an extended cut of the film that offers an additional three minutes. The original mono German track is used for the transfer, presented in lossless form with English subtitles, and sounds clear. An array of new supplements are included to flesh the release out. The first is a 17-minute chat with Franco that covers how the film came to be, his opinion of how it stacks up to Vampyros Lesbos and his memories of Soledad Miranda’s tragic death. When the subject of awards comes up, he offers a heartbreakingly tough assessment of his own skills while also pledging his eternal love to cinema. Next up is Miranda historian Amy Brown offering a 20-minute overview of the star’s too-short life and career. She teaches the viewer a lot about Miranda’s prolific pre-Franco career, which included being a flamenco dancing prodigy and a short stint as a pop singer in addition to several films, and reveals how and why she transitioned in her darker work with Franco. It also includes plenty of intriguing clips from Miranda’s early films that give the piece some nice visual variation. The third piece is a 13-minute chat with critic/Franco aficionado Stephen Thrower, who has a lot of insightful thoughts to offer up about this film. He pinpoints the making of this film and Vampyros Lesbos as the beginning of the “constant shooting” approach that would define the rest of Franco’s career, reveals it is a rewrite of The Diabolical Dr. Z and offers a nice appreciation of Miranda’s expressive gaze. The interview segments are rounded out by a brief (9 minutes) but eventful chat with actor Paul Muller, who looks back fondly on Franco and gives an intriguing actor’s-level insight into Franco’s guerilla, make-it-up-on-the-fly approach to filmmaking. Also included on the blu-ray is the original trailer for She Killed In Ecstasy, which could be accurately described as two-and-a-half delirious minutes of intermingled carnality and violence. And that’s not all this set of She Killed In Ecstasy has to offer. It also includes a second disc, a CD that is devoted to release of the Manfred Hubler/Siegfried Schwab score for this film and two others (Vampyros Lesbos and The Devil Came To Akasava). As Mondo Digital pointed out, this is the complete original CD program that was released as a limited edition before being reissued in an edited-down form as the Sexadelic Dance Party compilation, which was an underground hit in the mid-90’s. This 24-track compilation mixes melodic lounge-music moves with psychedelic experimentation to create a hypnotic aural trip back to the turn of the ’70s. It’s a key part of these films’ appeal and fans will be thrilled to have this full-length release. In short, this is an excellent release of She Killed In Ecstasy: the transfer is excellent, the supplements take you deeper into the Franco experience and the CD really puts it over the top. If you’re serious about your Eurocult fare, add this to your shopping list. To read Schlockmania’s film review of She Killed In Ecstasy, click here.